Today’s MOTD was found in the AIGA Design Archive. It is a graphical representation of an orchestra pit and shows the spatial relation of each instrument section. *Corrected. Thanks for the feedback Deborah! Today’s MOTD is a fun map showing the hot Hollywood locations of the rock and roll scene in the mid 1960’s. Today’s MOTD is a look at the inside of a guitar modified with a Parsons-White Stingbender. The B-Bender was invented in 1967 by musicians Gene Parsons and Clarence White of Nashville West and The Byrds. The device was originally called the Parsons/White Pull-String, later renamed the StringBender, and is now best known as the B-Bender. Early prototypes developed by Parsons (a machinist as well as a drummer) included multiple bending devices for the E, B, G and D strings, but guitarist White decided he preferred a single B string bender in the final design. The B string is bent up a full tone by pulling the guitar neck down. This puts pressure on the strap, which is attached to a spring-loaded lever at the base of the neck. The lever arm passes through the body of the guitar and is connected to the B string behind the bridge. White’s 1956 Telecaster with the original Pull-String is now owned and regularly played by Marty Stuart. In 1973 Parsons started making and installing the Pull-String himself, and renamed it the StringBender. 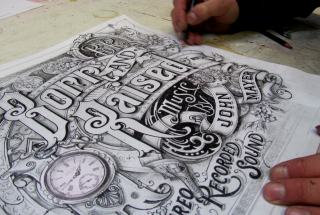 He eventually made as many as 2,000 custom installations for guitarists including Jimmy Page of Led Zeppelin. Today’s MOTD is a simple chart of the beats per minute and timing information for the Beatles song Yellow Submarine, on a blackboard design. Check out Mean Speed Music Review for more great Beatles information and visualizations!